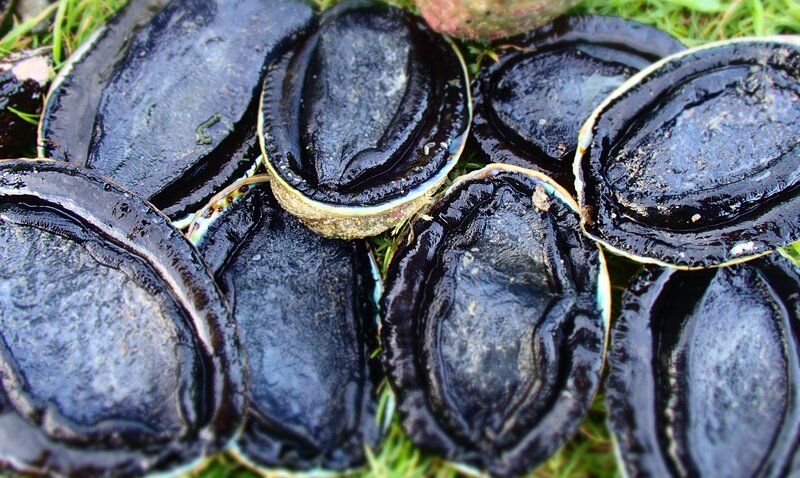 If there is one thing that I love as much as Australian blacklip abalone (Haliotis rubra), it is New Zealand paua (Haliotis iris). And I’ll go pretty close to the ends of the earth to get it. Southland to be precise; the remote south coast of remote New Zealand’s remote South Island, or even the more remote Stewart Island that hangs off the bottom of that. If you do happen to get there and find someone else holidaying in Southland, as often as not they will be a Southlander themselves. It is that kind of wonderful place with wonderful people where there are plenty of reasons either not to leave or to make an effort to get back if you do. As long as you are of the opinion that paradise can be often cold and wet, then this is it. 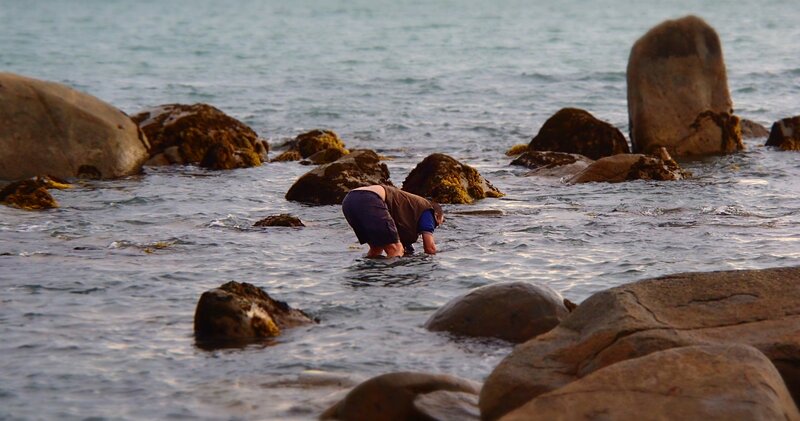 If you really time it right and get lucky, you might even get some paua without getting too wet, but this means getting to the right spot in the short window of the bottom of the lowest tide of the month as far as I can work out. If you strike out, there is at least always a pretty good chance of some lovely greenlip mussels (Perna canaliculus) for consolation. 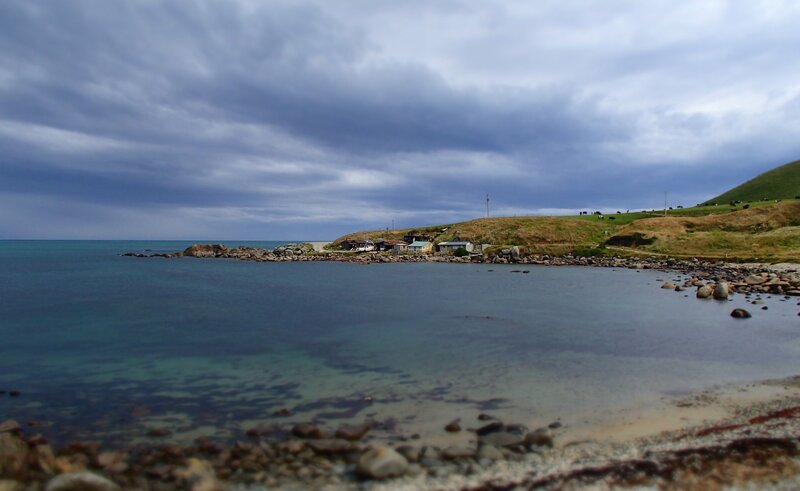 Off Southland, you will be doing well to get clear enough water for good snorkelling visibility, so it seems to me that you still want the bottom of the tide for that and to find a sheltered spot in shallow water on any typically murky day and just fumble about as best as you can. A sure haul of big ones would probably want you in some more challenging water and ideal conditions, but in the end you just have to make do with what you get. Get yourself across the Foveaux Strait from the south coast to Stewart Island (Rakiura) on the other hand, hire a kayak for a few nights out in some of the huts around Paterson Inlet, take a decent wetsuit and your mask and snorkel and things certainly get easier. They don’t get warmer mind you, and it still rains on more days than it doesn’t, so you just gear up and embrace it as ‘part of the charm’. I have to say that I hate those recommendations of ‘things that you should do before you die’, like paraglide naked in the moonlight with whale sharks in Lappland. 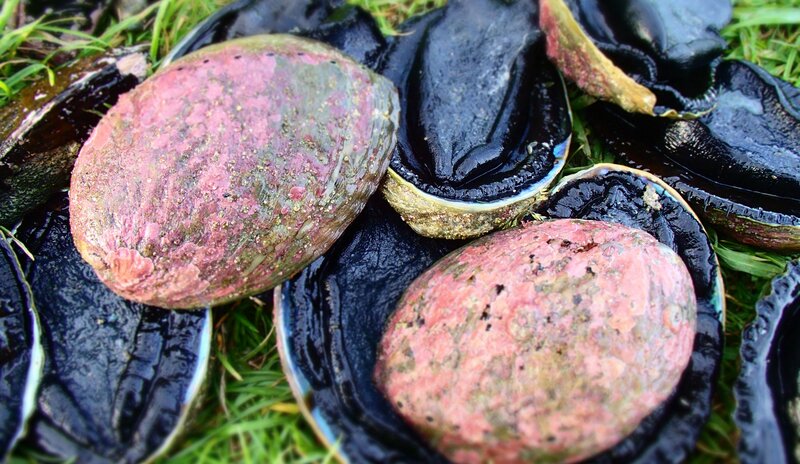 But still, if eating fresh paua (or any seafood you took part in landing) at the bottom of New Zealand turns out to be one of them, you are sure to be glad of it. Cook them as you would other abalone, sliced and tenderised in my view, sautéed hot and fast in butter (see here). 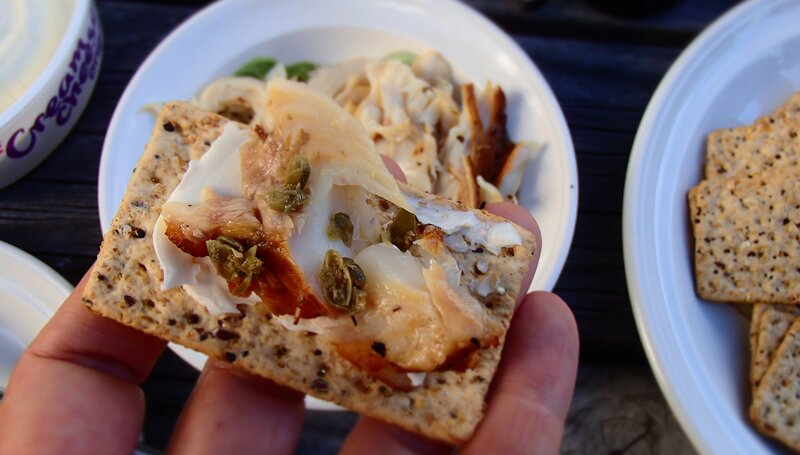 Generous serves in a sandwich of that cheap soft white bread you mightn’t let your kids eat, particularly when camping, can be perfect (and a filling with an (irrelevant) market value of $10 on 10c bread is somehow strangely and ironically decadent). If patience was indeed a virtue, a great many more fishermen and women would be saints. And if persistence was instead the virtue, almost all of those who keep on fishing through most of their lives would be candidates. Because that is what fishing so often seems to call upon. I know one bloke who heads out to catch live bait in the afternoon to fish dusk in one place, the turn of the tide in the night at another and has been known to catch a few z’s on the floor of the dinghy before trying another tide change or dawn, only to go home empty handed. When many, including me, might have been more inclined to take the squid from the bait catch home for a meal at a decent hour, he is after Sydney Harbour’s game fish and only its game fish – kingies (Seriola lalandi) in the day and jewies (Argyrosomus japonicus) in the night. For others, the persistence is a fierce refusal to be beaten by a particular fishing spot or method; returning again and again because they know that sooner or later the fish will be ‘on the chew’. 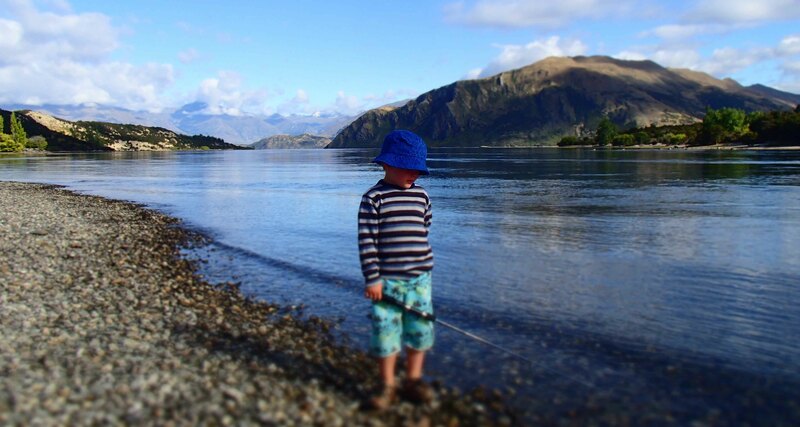 For me, it is trout along the shores of the outlet of New Zealand’s Lake Wanaka where the Clutha River begins. But I persisted. I recognised that a lot of the time I was fishing with the sun too high because with a kid, twilight was an increasingly difficult time to get out fishing. Or that I was I running lures too high in the water because they cost too much money to risk busting (another one) off on the lake floor. And I knew that I had started to often fish… perhaps ‘ambiently’ is the word, just casting and retrieving mechanically with the consoling pleasure of simply being there, perhaps on my own, perhaps with the boy along for the outing, a play and a splash. The place I am talking about objectively presents a scene that anyone would call beautiful, but which for me has somehow become some sublime treasure as one of the key touchstones of the Kiwi part of me (an Australian for the most part). But as far as the actual core purpose of the activity goes – trout (or land-locked Quinnat salmon as an outside chance) – nothing. For close to three consecutive annual trips. And then finally, this year, one long skinny jack-jawed old male brown trout (Salmo trutta). I was, quite simply, utterly joyous with my prize. If you had asked me, when that fish was securely on shore, if I was content to simply fish for the sake of wetting a line in paradise, I would have laughed disdainfully in your face. When push comes to shove, there is inevitably one core and utterly dominant reason why I fish, and that is to catch fish and eat it. If you had come to me with an insistence that I put it back because you have bought into the cruel perversity of catch-and-release, it would more likely have been you taking a swim (seriously, if you want them to remain in the water instead of a pan, then don’t give them a hook in the face to start with). There was nobody there to see me walk back to the car that evening, nobody to see a two metre man feeling like a three metre one walking with a two foot fish feeling like a three foot one. For all that this fish was destined for the plate and completely guaranteed a welcome reception when it got there, a big old seemingly half-spent male is still not the ideal animal for it. 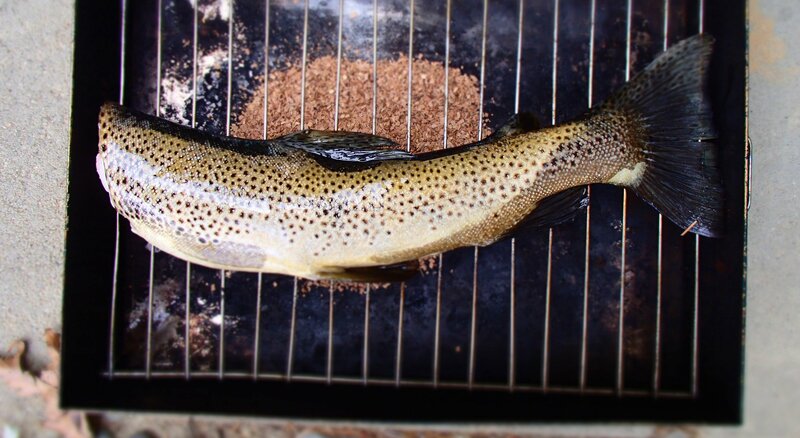 But thankfully, there is possibly nothing wrong with any of the salmonid fish that a hot smoker can’t fix. A mix of manuka and apple wood sawdust, 30 mins in the hot smoker (one full load in the methylated spirits burners that drive it all plus some time finishing as the box cools down), some decadently expensive horseradish cream and some crackers, and it was all worth it. Perhaps as many as twenty outings (albeit some very cursory) over three years, more than $300 in fishing licences, maybe $200 in gear and a great deal of salivating expectancy; all down to what was essentially a pretty simple feed. And all of it worth it. I have long struggled to grow thyme (Thymus vulgaris) in my herb garden, but now I know the answer. The trick is to start in some tough dry mountains that swing from baking heat to bitter cold, erode your land with huge scale sluice mining right down to lifeless rock scree, infest it chronically with rabbits and leave it be for a century. 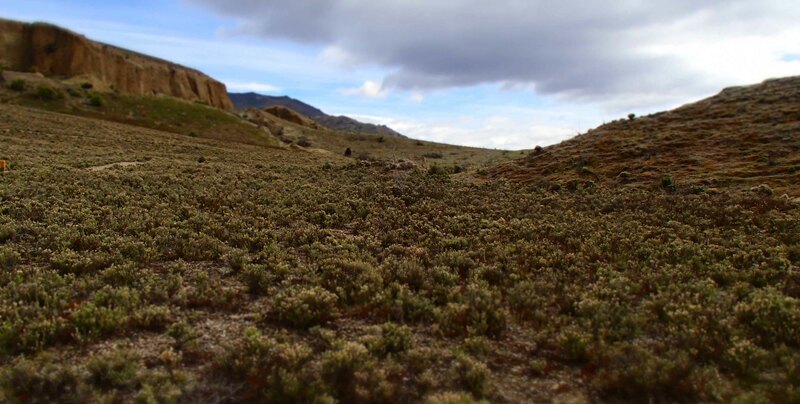 This is the setting for some stunning expanses of introduced wild thyme in New Zealand’s Central Otago. I also now know how beekeepers here can honestly claim to be producing reliably monofloral thyme honeys – wonderfully rich with strong, mineral and herby bitter flavours. It is the recently visited Bannockburn Sluicings I have most in mind; a historic site preserving the remains of 19th Century hydraulic sluice mining for gold, where water was used to intentionally erode an entire mountainside away. 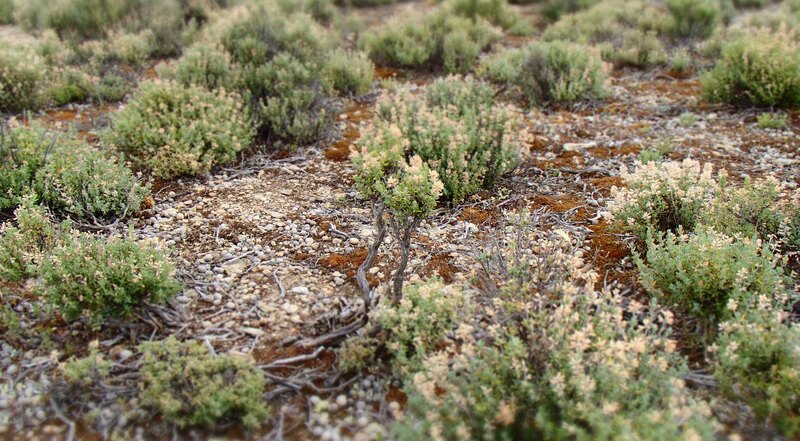 Here the thyme is practically a monoculture and is similarly prolific in other areas across much of Central Otago where little else will grow or survive the rabbits as well. It is a peculiar landscape of peculiar scale. You may look at the big view and struggle to imagine the former landscape where clifftops mark an original level over crinkled badlands surfaces that were tens of metres underground only 150 years ago, reminiscent of the mesas and buttes of an American western. Then at the macro scale, the gnarled tough trunks of these hardy survivors look most of all to me like a miniaturised southern Australian desert scrubland – mulga (Acacia aneura) shrunken to a 1:100 scale. So I tip prune off a modest crop, reminded by the pea sized mulch of droppings left across the land that I might get out hunting and be up for a rabbit stew. A taste test on a batch of breakfast hashed potatoes is delicious, strong and earthy; resisting the temptation to overuse some of the abundance of it proves wise, with just a small pinch giving a wonderful lift. It then sprinkles on some roasting pumpkin destined for soup and similarly gives a subtle herby lift. I leave stunned by how I have managed to hitherto not realise how good this wild herb is; and by how ridiculously abundant it is. 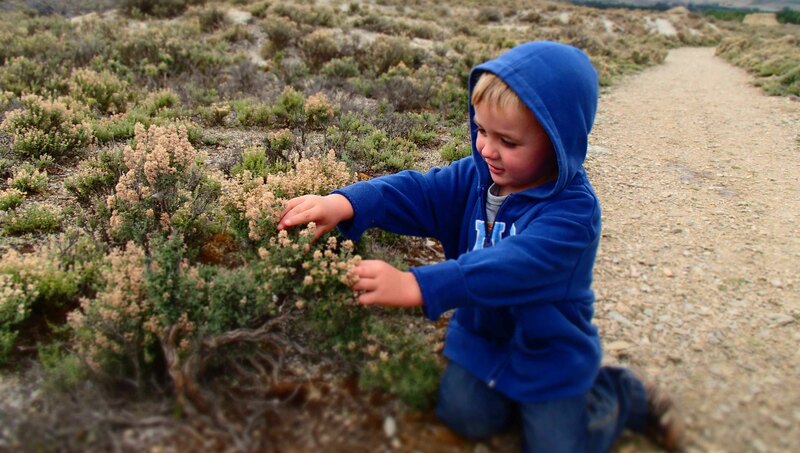 The Boy, not actually picking but pretending to be the Giant of the Wild Thyme Forest. My last hunted rabbit was from our bush block, a once-ever hard-won trophy of hours of twilight stalking a place with few rabbits and just a bow and arrow to do it with. Not that I’ll give up on it; the twilight walk with bow is a beautiful way to take a stroll and bowhunting rabbits is a great challenge, relatively humane and one thing that hunting with firearms is certainly not – quiet, peaceful even, despite the mortal intent. That was a few years ago, before a child took away much of the ability to wander off at meal/bath/bedtime with the bow. My last rabbit that was not strictly ‘hunted’ was in the rabbit capital of the world as far as I can work out – New Zealand’s Central Otago. It was ‘harvested by automobile’ (roadkill) on the way back from a fishing trip with no fish to claim for it. The front end of the bunny went under the wheel, the back end went in a pot. That was a year ago. One month ago I was back in New Zealand (something of a second home) and was able to go after rabbits with considerably more intent on an outing with a cousin of mine. While still largely a bowhunter at heart, I am also now something of a convert to hunting rabbits with a 20 gauge shotgun. This is smaller version than the typical 12 gauge, and my cousin’s one a beautiful Turkish Huglu, accurate, light on recoil and relatively quiet. And my cousin’s godfather’s property is an even more beautiful high country station of more thousands of acres than I can work out. 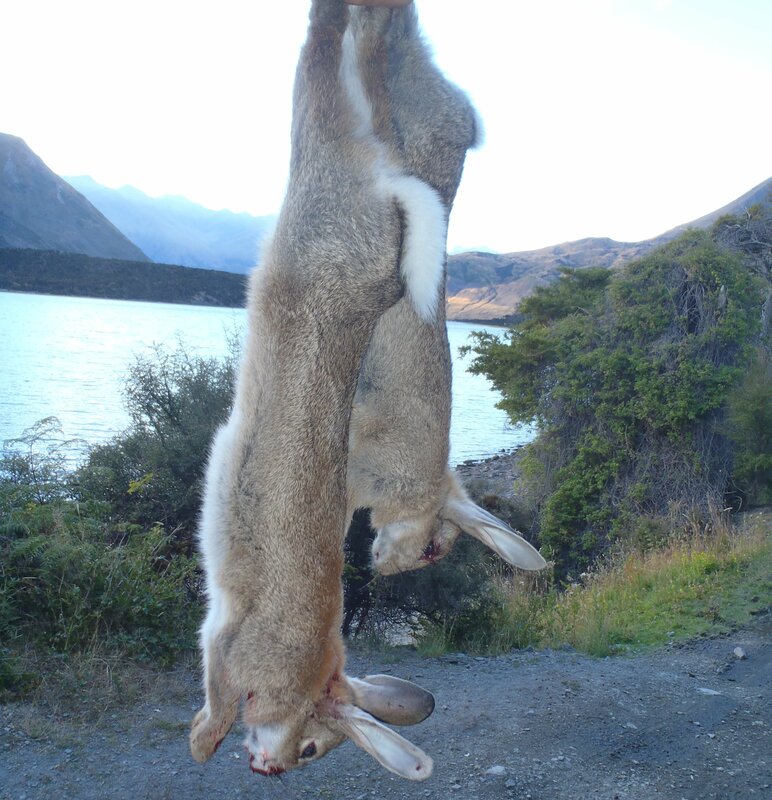 In central Otago, rabbits are so abundant that you harvest them more than hunt them. All you need is somewhere to do it and something to do it with and you just start filling up a box. Where they scatter across steep slopes in front of you it is like an arcade game where you are more likely to fail by not choosing one in time rather than through poor aim. The time to stop harvesting is likely to be when you have about as much as you either want to process or eat. 7 rabbits in our case, as they were all basically for me, and with two weeks before returning to Australia. That said, the time to stop for others at the nearby annual ‘Easter Bunny Hunt’ was more than 23,000 in 2011 which, for charity, the local Boy Scouts then composted. I have mixed feelings about this carnage, my greatest reservation being the knowledge that hunting always treads a delicate balance between a noble approach to a respected prey solemnly killed and a descent into an instinctive bare-toothed bloodlust that can lie within any man. My insistence on eating any prey that I kill is much a discipline to keep me on the nobler side of that equation as it about any ethic held for the sake of the animal. It seems inevitable that bloodlust runs high in the Easter Bunny Hunt. Rabbits, in both of the countries where I am a citizen, are remarkably unpopular as both wildlife and food. In Australia they still bear some of the stigma of ‘Depression food’. In the first half of the twentieth century two wars bled the countryside of too many of its young men, the Depression took farms from the smallholders, the continued industrialisation of agriculture pitted profit margin against intergenerationally improving land management, and rabbits were compounding it all by running rife in their stripping of livestock forage. Theirs was one of many contributions to the enormous loss of topsoil from which the country will never recover. Their meat was a small compensation. Hunters toiled and men rolled carts through poor city streets with their cry of “rabbitoh!” selling cheap meat; canneries shipped tonnes of the stuff to Europe; and the now-iconic Australian felt hats were pounded from the skins of one of our worst environmental disasters. Countless miles of rabbit fence laced the country; poison baiting, gassing, warren-ripping machinery and explosives were a cost borne in billions by farmers and the state; country children kept ferrets with which they could join the fray. Eradication was the passion of many and the success of none as no amount of hunting could ever get rid of them entirely. A prey as small, numerous and fecund as rabbits in Australia and New Zealand will always rebound from the populations left when hunting returns dip to levels too low continue. Biological control from Myxomatosis in the 1950s, then Calicivirus in the 1990s, each brought significant temporary respite but were then followed by resistance that is still growing. Rabbits, it must be said, are not now problematically common in the parts of Australia I am most often in – the better watered east coast and highlands – but many parts of the country (and surprisingly large parts of cities) would consider themselves plagued. In Central Otago, rabbits are a problem by which one could almost define the region. On my land in the NSW Southern Highlands I have previously felt, I shamefully admit, that it was a problem which I could actually do with a bit more of. There, our cheap dirt is so badly structured, thin and all-in-all crappy that rabbits struggle to burrow in it, relying instead on the rocky country and scrub for meagre cover. I have noticed them on the increase in neighbouring areas (around Wombeyan Caves) with soil to dig in and perhaps just a slight rise on our place. But after my New Zealand bounty I am no longer secretly wishing for more – I am in Otago often enough these days to get my fix there. 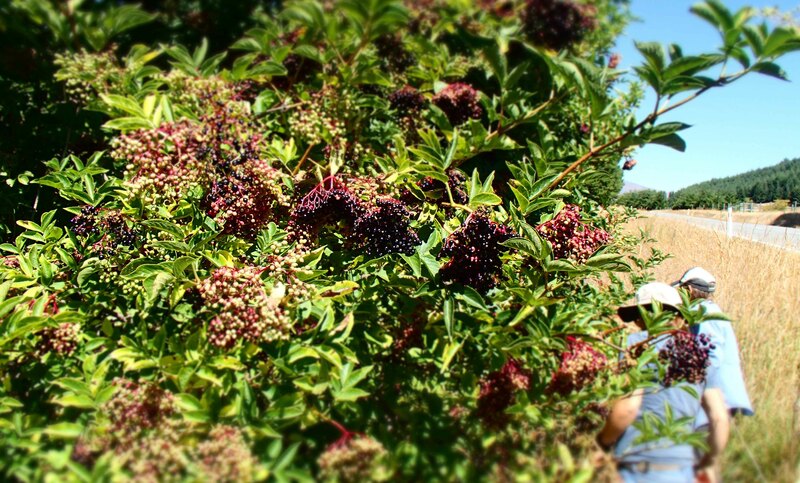 Coming back to the Otago recent haul, an eternal truth reasserted itself: big harvests mean big processing times. Although a redeeming feature of the rabbit is that from whole rabbit to clean carcass is a pretty quick turnaround. When fresh, the skin is pulled off like socks with just a few knife cuts along the way. The head and feet cut away with that skin, then a clean slit up the belly allows the guts to be pulled away fairly neatly with an extra cut through the pelvis to get the last of it clear. If there is bruising from shotgun pellets, sections may be cut away, the meat poor front legs and ribs in their entirety if it is at all messy up there. Then washed, sectioned (maybe 6 pieces per animal), browned and stewed, that simple. I favour whatever takes shape with other available ingredients and googling ‘Spanish rabbit stew’, doing my best with stock, oil and mushrooms to replace calls for chorizo sausage. And I cook low and slow (<150 degrees and >5 hours). And then in this case at least, I eat so much rabbit over the next week that I can probably go without until the next time I am back in New Zealand. Actually, mum if you are reading this, I have remembered that there are four legs still in the freezer there that you might want to do something with.